Hats off to the CSS Working Group, it must have been a busy few weeks. Not only have they released several updated specifications, most notably the long awaited publication of the CSS2.1 specification as an official W3C recommendation, but also introduced a major redesign of their home page. The release of CSS2.1 as an official recommendation also paved the way for the CSS3 Color module to advance to the recommendation stage, becoming the first CSS3 specification to be released as an official W3C Recommendation. The first working draft of the CSS2.1 specification was published almost ten years ago in August 2002, with the aim of correcting errors and improving interoperability from the original CSS2 specification (first published as a W3C recommendation in May 1998). Work on the specification has stepped up in recent months, with a number of updated drafts released, as the working group pushed to complete the specification, a goal which was finally achieved on 7th June 2011. W3C, the standards body for the suite of technologies that together provide an Open Web Platform for application development, today announced new levels of support for Cascading Style Sheets (CSS), the language for adding style to Web content. W3C released an update to the core CSS standard (2.1) to reflect the current state of support for CSS features, and to serve as the stable foundation for future extensions. CSS has been in widespread use as an Open Web technology for more than a decade, but it took many years for implementations and the specification to converge. The collective efforts of the CSS Working Group, implementers, contributors to the CSS Test Suite, and the W3C CSS community have made interoperable CSS a reality for the Open Web. More than 9000 CSS tests have made it easier for designers to create style sheets that work across browsers, and across devices. CSS interoperability plays an important role in the rapid adoption of W3Câ€™s Open Web Platform, which also includes HTML5, SVG, WOFF, APIs for geolocation and offline storage, real-time communications, and a host of other technologies for building rich, interactive applications. With CSS2.1 now an official recommendation, the way should be clear for several of the newer CSS3 modules to also progress to the recommendation stage. Not only will the working group have more time for the development of CSS3, but as the individual CSS3 specifications â€˜build onâ€™ the CSS2.1 specification, none have been able to move on to the recommendation stage until CSS2.1 was first released as a recommendation. In fact it didnâ€™t take long for the first of those modules to be released, CSS3 Color was released as a W3C recommendation the same day. Now that we have published CSS 2.1 as a Recommendation, the Working Group can focus its efforts on rapidly advancing CSS with new modules for improved layout controls, new visual effects, broader international support, and more. You can view the full CSS2.1 specification here. The publication of the CSS3 Color module as an official W3C recommendation on 7th June 2011 marks the end of a long development process, the module was first released as a working draft in June 1999, although not all of the original features have made it into the final specification. You can find the full specification here. 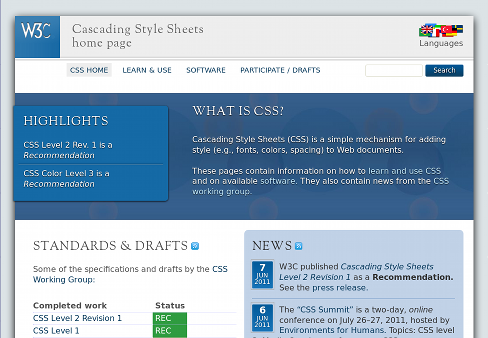 The CSS Working Groupâ€™s home page has undergone a major redesign, unveiled to coincide with the publication of CSS2.1. The new design, pictured below, was the brainchild of Divya Manian (although the original design has been reworked by the W3Câ€™s Bert Bos) and brings a much needed fresh new look to the working groups web pages while bringing the design more in line with the new look of the main W3C site, launched in March 2009. You can read more about the redesign on the CSS Working Group blog, and you can see the new site in all itâ€™s glory here. This entry was posted in CSS, News by IC. Bookmark the permalink.